Jack Hughes (Orlando, Fla.) scored the game-winning goal with 28.3 seconds to play and both Oliver Wahlstrom (Quincy, Mass.) and Joel Farabee (Cicero, N.Y.) registered two points as the U.S. National Junior Team defeated Russia, 3-2, here in its first pre-tournament game ahead of the 2019 IIHF World Junior Championship. 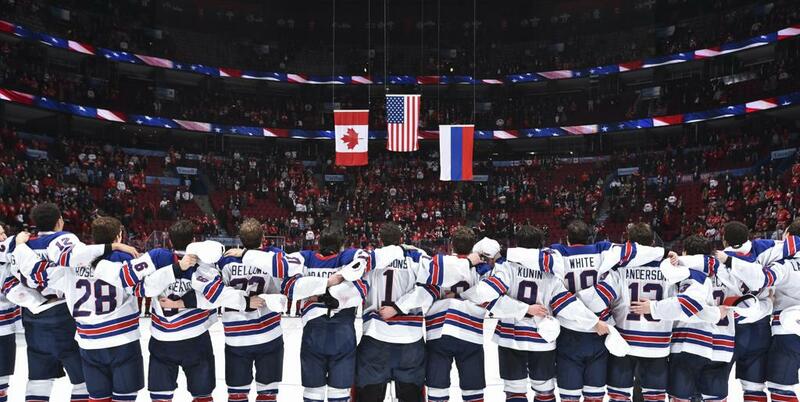 "It wasn't pretty, but a win like this is one that brings everyone closer together and that's important for our team chemistry," said Mike Hastings (Crookston, Minn.), head coach of the 2019 U.S. National Junior Team. "Players took advantage of their opportunities here tonight. Our staff certainly has our hands full as we continue evaluating here with one more pre-tournament game on Saturday." 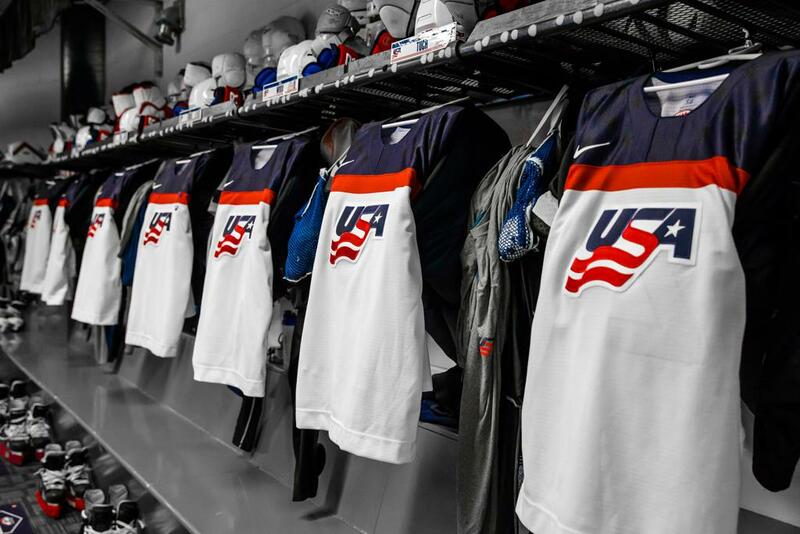 The U.S. (1-0-0-0) will face the Czech Republic in its final pre-tournament game on Saturday (Dec. 22). Puck drop is slated for 7 p.m. local time (10 p.m. ET) at the Langley Events Centre. The U.S. controlled the first five minutes of play as it generated an early 4-1 shot advantage. Its best chance came when Hughes collected the puck at the U.S. blue line, carried it into the offensive zone and around a Russian defender for a chance that was blockered aside by Russian netminder Danil Tarasov. Russia opened the scoring 9:28 into the frame when Alexander Alexeyev connected off a pass from Alexander Yaremchuk. The U.S. nearly tied the game moments later when Sammy Walker (Minneapolis, Minn.) won an offensive zone faceoff back to the top of the left circle where Jay O’Brien (Hingham, Mass.) fired a quick-wrist shot that was gloved away by Tarasov. The middle frame opened with a big save from U.S. goaltender Spencer Knight (Darien, Conn.) just 1:30 into the frame before Tyler Madden (Hartford, Conn.) nearly converted on an individual effort just two minutes later. After collecting the puck at the redline, Madden skated down the right wall and drew a Russian defender toward him before cutting back and around the defender for a shot that was denied. Russia gained a 2-0 advantage with 10:17 to play in the stanza when Kirill Marchenko stole the puck behind the U.S. net and tucked it past the outstretched right leg of Knight. With control of play, the U.S. generated another pair of scoring opportunities in the final six periods of the frame. The trio of Hughes, O’Brien and Wahlstrom combined for the first opportunity when a nice passing play resulted in an attempt from the slot that went just wide of goal. Moments later, Jason Robertson (Northville, Mich.) dropped the puck back to Sasha Chmelevski (Northville, Mich.) for a shot between the hashmarks that was deflected up, off the crossbar and away from goal. The U.S. broke through with two goals in the first 10 minutes of the frame. Robertson opened the scoring with a deflection off a long-range shot from Evan Barratt (Bristol, Pa.). Three minutes later, Wahlstrom connected on the power play when he collected a pass from Jack St. Ivany (Manhattan Beach, Calif.), curled around a sprawled Russian defender, and tucked a shot into the top-left corner from close range. With 7:04 remaining, Wahlstrom nearly converted again with a breakaway effort but his backhanded effort was blocked by the right pad of Tarasov before a follow-up chance by Farabee was also denied. With 28.3 to play in regulation, Hughes scored the game-winning goal when Farabee found him at the top of the crease for a backhanded effort that slipped just inside the right post. Knight played the first half of the game in goal for the U.S. and made seven saves, while Cayden Primeau (Voorhees, N.J.) played the second half and stopped eight shots. Tarasov went the distance in goal for Russia and was credited with 26 saves. NOTES: Following regulation, the two teams played a scoreless five-minute three-on-three overtime before taking part in a shootout. The initial five-round shootout ended in a tie, 2-2, before Russia won in the ninth round for a 4-3 shootout advantage ... USA Hockey expects to name its final 23-player roster for the 2019 IIHF World Junior Championship by Dec. 23 ... The U.S. enters the tournament having medaled in three straight World Junior Championships for the first time in U.S. history after earning gold in 2017 and bronze in 2018 and 2016 ... John Vanbiesbrouck (Detroit, Mich.), assistant executive director of hockey operations for USA Hockey, is serving as the general manager of the U.S. National Junior Team ... NHL Network is the official U.S. broadcaster of the 2019 IIHF World Junior Championship. Team USA will play its preliminary round games in Victoria against Group B opponents Kazakhstan, Finland, Slovakia and Sweden. Quarterfinals will be split between the Vancouver and Victoria. The semifinal and medal games will be played at Rogers Arena in Vancouver. For more information about the tournament, click here.